". . . the author has cast her net too wide . 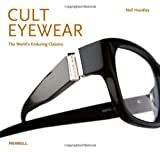 . ."
In Cult Eyewear: The World’s Enduring Classics, Neil Handley provides a rich history of eyeglasses starting in the late 18th century right up to the present.